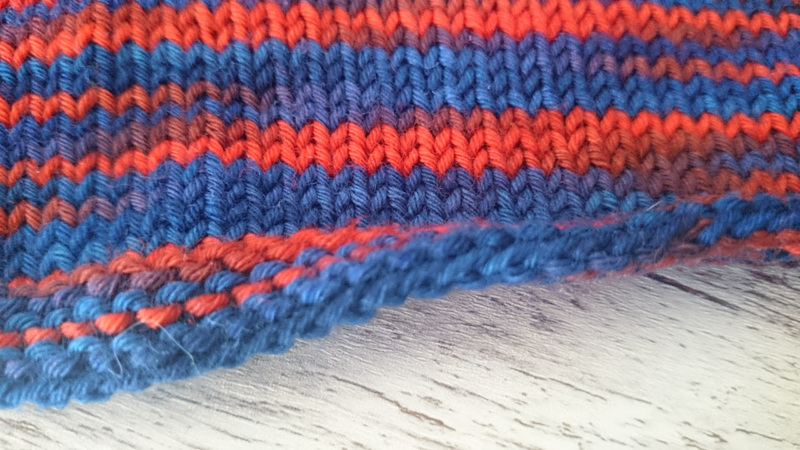 Last week, we talked a lot about how to knit gauge swatches and how to measure them. This week it’s all about possible pitfalls and problems. As a reminder and navigational help, here is the table of contents for this two-part part series again. If you are designing a garment intended to be worn with negative ease, stretch the swatch when you block it. And if you can, use blocking wires to distort the shape as little as possible (otherwise you may end up with scalloped edges). Then take the gauge of that for calculating your pattern. And wash the swatch the same way you would the wash the finished item. If you handle it differently, it may end up with a different gauge. 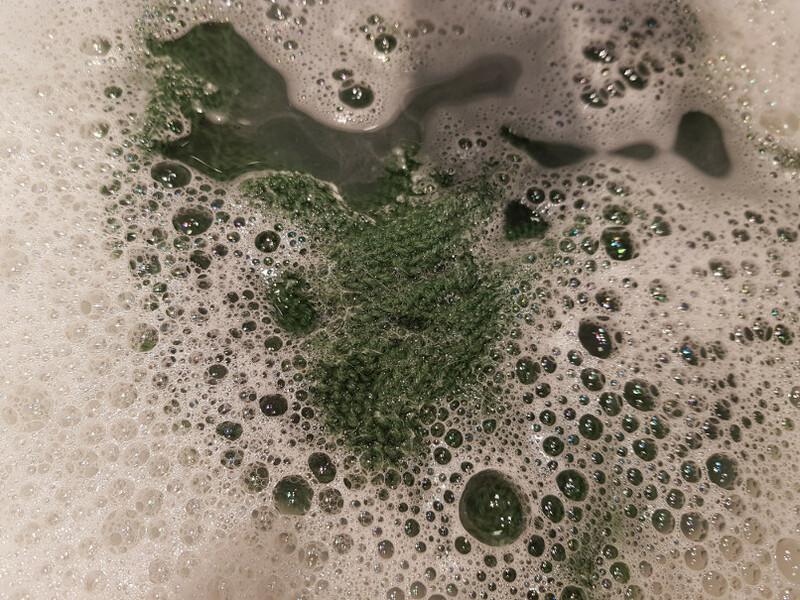 Now, I’ve read and heard many a knitter say things like “You’re supposed to wash them but who does that, really?”. I do, always. And since I started checking my gauge before and after washing, I can tell you, you really should. I’ve had swatches shrink an inch in length but gain the same amount in width. I’ve had swatches shrink in width while they gained in length. It happens very rarely that a swatch doesn’t change in size at all after washing. Acrylic fibers probably change the least. But it doesn’t just depend on the fiber but also the stitch pattern you are using. If you are following someone else’s pattern, try to use the same yarn as they do or one that is very similar in composition. 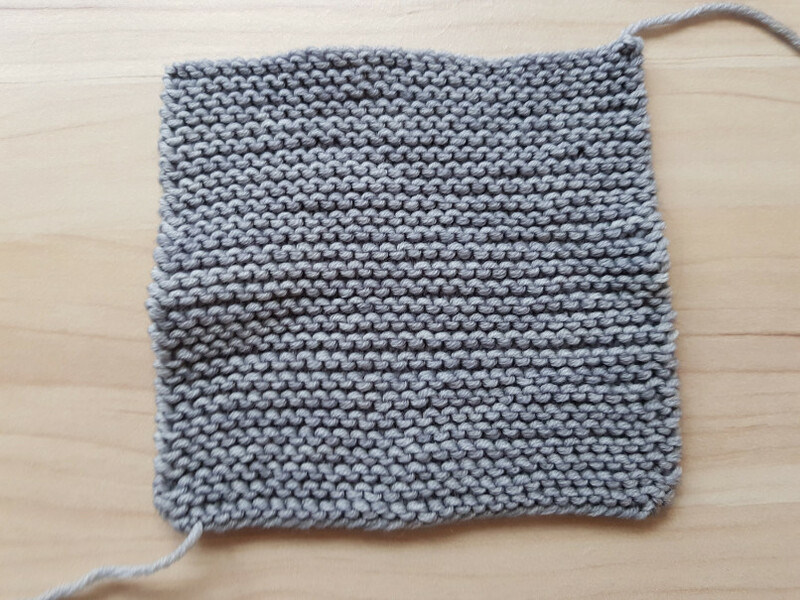 Otherwise, I would suggest also swatching at least the main stitch pattern just to find out how your chosen yarn will react when you wash it (if it’s a stockinette project, you’re in luck; no extra work). Or start with a sleeve (or something small like that) and wash it after you’ve knit a bit of it to see if your yarn behaves the way you are expecting it to. When measuring your swatch, use a ruler (preferred for method two of measuring) or stitch count guide that is at least 4 inches by inches. It’s a bit fiddly to get a tape measure to lie flat and straight sometimes, and they may even stretch out when they get old. Anything smaller just won’t help you get a decent measurement. If you measure over too small an area you will most likely not get an accurate gauge measurement. Over a larger area irregularities have a chance to even out and don’t matter as much. That is also why it’s good to take a couple of measurements and then calculate the average of those numbers. Short answer: No. And yes. And if you are designing you always have to know your row gauge. If you are following a pattern most of the time, it is not as crucial as stitch gauge. But if your row gauge is off by a lot you may have to recalculate armhole shaping, where increases and decreases are placed and how many plain rows are between them for waist, raglan, neck or sleeve shaping. It can even mess up your toe up socks. 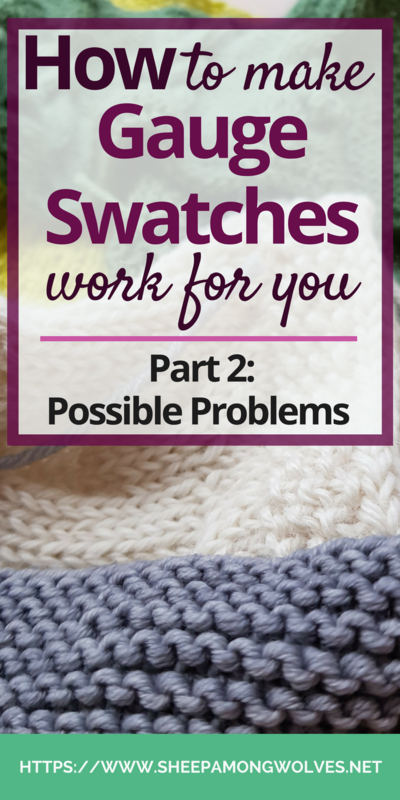 It can also be vital for any colorwork or stitch motif panels, or they may end up too tall or too short. Usually, I would try to hit stitch gauge first and then see how far off I am with my row gauge and recalculate where I need to. If you are doing a sideways knit, your row gauge is, of course, more important than your stitch gauge, so try to hit row gauge first. It seems to be practically impossible to hit both stitch and row gauge at the same time. It is so rare that knitters everywhere shout out in surprise and joy (often seen on Twitter) when it happens. As close as you can but it also depends on the item you are knitting. Gauge is less important on oversized cowls or shawls. And when you are off by a little it doesn’t make that much off a difference on a small item like a hat. But it is critical on things that are intended to fit and are larger, like a sweater. Here even a small difference in gauge can mean you end up with a beautiful looking finished sweater that unfortunately doesn’t fit the recipient at all. Example: If you’re getting 4.2 sts per inch instead of 4.5 it doesn’t make much difference on a small item; over 30 sts you get a difference of about half an inch or a little over a centimeter (6.67 to 7.14 inches or 16.94 cm to 18.14 cm). But over 180 sts, that’s almost a 3-inch or 7 cm difference (40 to 42.86 inches or 101.6 cm to 108.86 cm). If you can’t get gauge or like a different fabric better, calculate how many stitches you need to obtain the size you want. Then check the pattern to see if there is are instructions for a different size that matches (or gets very close to) that number. You will then knit all instructions on width for that size and knit the instructions for length for your original size – or recalculate those if you have to. This is where preparing your patterns by highlighting instructions before you start will help you out. Craftsy has also a class on the subject with a lot more information that is worth checking out: Getting Gauge: Perfect Knit Fabric Every Time (*) with Sarah Peasley. 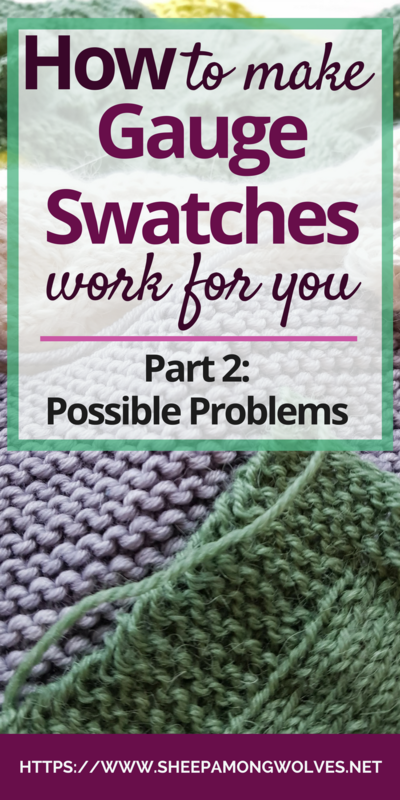 Do you knit gauge swatches? Do you love them or hate them? Have they lied to you before or saved you instead? Please let me know in the comments below. I hope you liked this post. It was a lot of work, but worth it, I believe. Let me know what you think. Next week: I’ll show you my favorite things (mostly knitting related) of January. There will be links to other blogs, to yarn and other things. This will be a new monthly segment, so come back next Friday and tell me what you think!